Strips compatabile with the Fastback 9. Strips compatabile with the Fastback 20. Strips compatabile with the Fastback 11. Strips compatabile with the Fastback 15xs. Not sure what type of Fastback Strip You Need? This is MyBinding video. 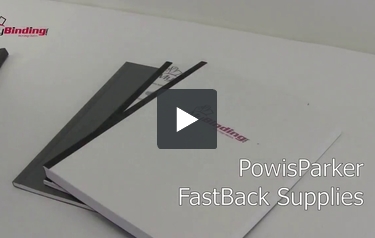 Are you looking for Powis Parker binding supplies? You’ve come to the right spot. MyBinding.com is proud to be one of the select group of dealers throughout the US that carries the full line of Powis Parker FastBack Binding supplies. So no matter what Powis Parker binding strip you’re looking for – super strips, speed strips, pump strips, perfect back strips – we have what you need, or if you’re looking for Powis printer cartridges or foil fast cartridges, we carry them all. In fact, we keep most of the FastBack supplies right here in stock for your convenience. We also carry the full line of FastBack covers and FastBack binding equipment. So check us out, give us a call, we’d love to answer the phone and help you find exactly what you need. And we specialize in customization so we can get you strips and covers that match your design, your business and what you’re trying to do. When image matters, MyBinding.